We grow a large selection of native Manitoba native prairie wildflowers and grasses. All our plants are grown using seed which originated from local prairie remnants. We now grow most of our seed from our own nursery stock. We recognize that healthy plants are built from the ground up. Since Manitoba native prairie plants need strong roots to survive, we nurture the roots first. We prefer to use compost and slow release organic fertilizers rather than synthetic fertilizers that can lead to over stimulated foliage and weak stems and roots. For this reason, the foliage of our plants may appear small, but below the surface they already have vigorous root systems. Compost is also full of essential nutrients which synthetic fertilizers cannot provide, creating stronger plants that are more resistant to pests and disease. We use deep plugs and trays to allow for a larger root mass This means they are hardy and able to penetrate our tough clay Manitoba prairie garden soils. They will establish quicker, covering bare soil to discourage weeds. All our plants are grown from local seed using all natural fertilizer and pest management. We always search for Eco-friendly alternatives to help create a healthy greenhouse ecosystem using local ingredients whenever possible. We work very hard to keep our costs low so we can pass those savings on to our customers. We believe keeping our plants affordable helps to increase populations of native prairie native Manitoba plants. All our seed is grown from our own nursery stock or collected with landowner permission from our local prairie plants. When collecting seed we are careful never to deplete its source. We offer strictly nursery grown plants; none are dug from the wild. 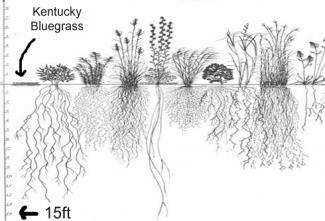 In their first year of growth many native prairie species appear to be small, but in fact a great deal of growth is occurring underneath the soil surface. Some have roots that may reach up to a meter or more. This allows them to draw moisture and nutrients from deep in the soil and survive the extreme prairie environment. So please be patient, most prairie wildflowers don't flower until at least their second year, but your plants will produce lots of beautiful foliage and flowers year after year, once they have established a strong healthy root system.